Here are some quick impressions of the title regardless. The Mario & Luigi series has been a consistently enjoyable romp, and the latest outing, Mario & Luigi: Paper Jam, doesn't break the cycle. While it doesn't break the mold, it's an adventure that's both colorful and challenging. When Luigi manages to unleash the entirety of the Paper Mario universe upon the Mushroom Kingdom while hanging out in a store room in Peach's castle, he and Mario must then set things right. Seeing the paper-thin Koopas and Toads intermingling with regular Mario models is intriguing, and sets the stage for the rest of the game. 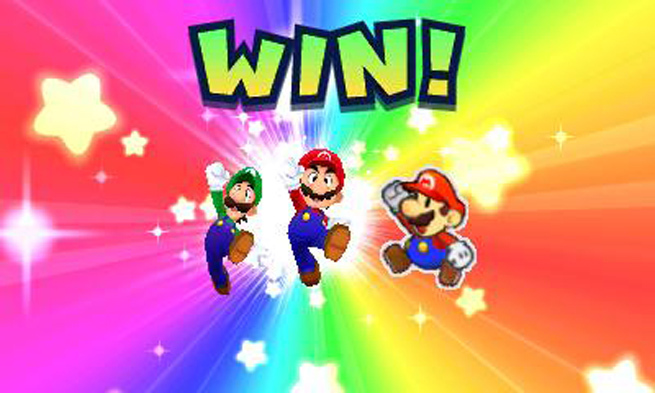 Mario and Luigi may be controlled independently to tackle various environmental puzzles, though they join up for savory turn-based battles with timed combos. Paper Mario's ability to make copies of himself, Battle Cards with special abilities, and amiibo support ensure the battle system is just as zany as it's ever been, if derivative. Stunts like Paper Mario's kite flying and shuriken tossing are hilarious and well-timed, though there isn't enough of the Paper Mario world here as there could have been, which is a glaring oversight on what could have been. It's a breath of fresh air to interact with these characters, and a dearth of Paper Mario content while Mario & Luigi action in abundance is disappointing. Mario & Luigi: Paper Jam is still every bit as fun as its predecessors, despite the uneven ratio of Paper Mario to Mario & Luigi. It doesn't go off the beaten path, but it's a worthy addition to the series.